As a fantastic accessory to any shop gantry crane, this “Winching pole” is a great way to lift the load without getting all tangled up in chain, ropes or cables. The manual hoist winch is designed to balance away from your work, be at your working height and pivot to where you need it. Fishing pole style winch lift. Balances away from the load to stay out of the way. Various winch options available for various capacity. Includes plans for a simple load leveler. Capacity is dependent on materials and components – steel, winch, cable and rigging. These are the perfect crane &/or engine hoist accessories. The “Winching Pole”, as we like to call it, is a mechanical hoist winch that makes the load easy to lift while staying out of the way. The load leveler is even simpler. These are the perfect accessories to go with our Mobile Overhead Crane or any other brand crane for that matter. The “Winching Pole” is a hand crank winch engineered to balance the handle and crank away from your work and to stay out of the way. It also reduces the head height required by other devises like chain falls or “come-alongs” so you have more space for lifting and working under the crane. Most of all, there are no chains or cables to drop down and get in the way! The load leveler is a quick and easy way to level a load. It’s a really simple design to build in an hour or so, and cost a fraction of those commercially available. It’s not as easy to adjust as some, but very simple and functional. These two accessories make lifting tasks much easier. Build both today. Construction requires steel cutting and drilling (& optionally, welding). 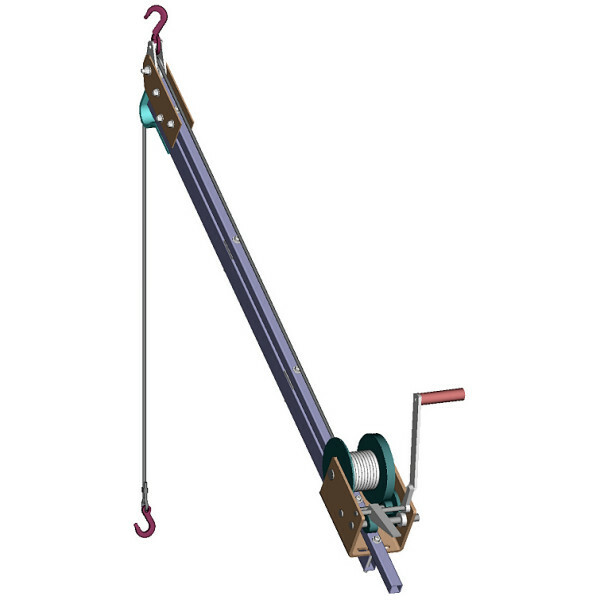 Plans include both the Winching Pole and the Load Leveler together with easy to follow, fully illustrated instructions. . . . More on What is in the Plans . . . These are the perfect accessories to go with our Mobile Overhead Crane and our Perfect Garage Size Crane. * Load capacity for both products will vary with equipment, materials, construction techniques, options, assembly methods and proper load distribution. Do not exceed manufactures limits for purchase components. Always use Extreme Caution when lifting. Build It Better Than You Can Buy It ! !